Bangalore, a city of adventure and a fast growing metropolis, this 'garden city' is the capital of the southern Indian state of Karnataka. Situated about 1000 m above sea level, it is known for its wonderful climate where temperatures remain moderate through out the year. It is connected by air, rail and road to all major cities of the country and has direct international connections to many cities worldwide. 8 million. Now a day the main attraction of Bangalore is M G Road area, where fast food joints, yuppie theme bars and glizzy malls are all the rage. 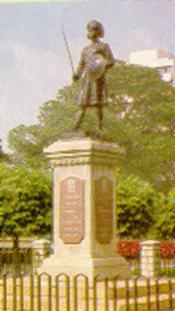 Bangalore's gentle climate, broad streets and green public parks made it the GARDEN CITY in 1800's. But after Indian independence the situation became almost adverse because maximum of the persons who were of good recognition like film stars and V I Pspreferred their establishments here. During the last decade Bangalore has undergone a massive transformation. The wide avenues, now dominated by tower blocks, heavy traffic and water and electric shortages have become the part of the city. Even the climate has been affected and pollution problem has become the major problem here. Currently more than 700 IT-companies are going about their business there. Among them are almost all the global giants of the e-business-sector which run both wholly-owned or partially-owned subsidiaries and joint ventures with domestic partners. In the meantime some prominent domestic software firms have also been established. The city?s software industry is highly export-oriented and handles a spectrum of services that ranges from fairly low-tech, labour intensive activities like data entry and transcribing work to much higher value-added activities like developing end-user applications and software packages or services. Bangalore is in Karnataka State and it is bounded in east by Andhra Pradesh ,west by Goa and the Arabian Sea; south by Kerala and Karnataka and north by Maharashtra . Bangalore is connected by air with Delhi, Goa, Hyderabad, Ahmedabad, Kolkata , Chennai , Cochin , Coimbatore, Mangalore , Mumbai , Pune and Tiruvananthapuram . 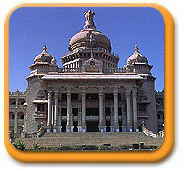 Bangalore airport is 13 Km north of the city centre ,serves cities throughout south India and beyond . The Indian Airlines Office is in Housing Board Building ,Kempe Gowda Road . Jet Airwaysand Sahara Airlines 5586976]are also here . Via Mumbai flights are available for New York ,Singapore ,London ,Paris and Gulf States . Air France --5589397 --Sunrise Chambers ,22 Ulsoor Road . Lufthansa --44/2 Dickenson Road . Qantas --2256611--Westminster Building ,Cunningham Road Singapore Airlines --2213833--51 Richmond Road . All national highways throughout the country are well connected with Bangalore .All types of tourist buses are easily available here on hire . Near the city tran station the central bus stand is located .Within the state bus services are available from K S R T C .Interstate buses are operated by K S R T C and A P S R T C .Private bus services are also available from Bangalore to the major part of the country but they are more expensive .Private buses leave from the street facing the central bus stand . Regular train services connect Bangalore to all the major cities in India such as to Mumbai in Western India, New Delhi in North India, Cochin in South India, Kolkatta in East India etc. Bangalore’s National Highway connects it to the major cities of India. The National Highway connecting Bangalore is superbly made with long driving and motels in between kept while upgrading the highway for the welfare of the drivers in mind. The statue is a 65 feet high depiction of Lord Shiva in a position of Padmashan or Lotus position. The statue is complete with Mount Kailash, the Lord's heavenly abode and the river Ganga flowing from his matted locks in the background. The entire area gives you a clear picture of the mythological legend related to it. The Bull Temple is dedicated to Lord Shiva's Vahana (vehicle), Nandi the bull. Here you can find a huge monolithic statue of the sitting bull that draws a large number of people to this place every day. The statue is 4.5 meters tall and 6 meters long and has been at this place long before the present temple was built. The sight of the Aquarium, which is the second largest in the country, is quite fascinating. Built in a well-planned manner, the Aquarium has a good collection of a variety of aquatic life. The Aquarium remains closed on Mondays.